The Devonshire Hospital began life in 1785 as the Great Stables for the fifth Duke of Devonshire's fleet of horses and carriages. In 1858 two-thirds of the property were granted to the town "for ever" by his son, the sixth Duke, as a hospital for the "sick poor", on payment of the nominal rental of 5 shillings [25p] per annum. When the Hospital opened in 1859 it contained 100 beds which later increased to 300.The remaining third continued to be used as stables until 1881. 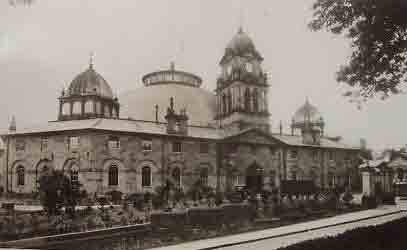 In 1882 the Hospital’s great domed roof was added, designed by architect Robert Rippon Duke. This masterpiece of Victorian engineering was for many years the largest unsupported dome in the world. The Hospital closed in 2000 and was taken over as a campus for the University of Derby. 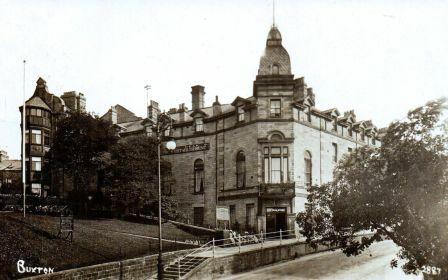 As well as The Devonshire Hospital, in 1914, Buxton had a small local Cottage Hospital, which had been in its present location since 1911 and became one of the foci of the post-war War Memorial Project in the town with an extension being opened on the 28th April 1920. With the outbreak of War, however, the number of Hospitals in the town increased greatly, to deal with, in the main, casualties returning or being evacuated from overseas. In addition, there are 17 local men buried in Buxton Cemetery, many of whom died in local hospitals, plus 8 burials of men from other parts of the UK, who also died in Buxton, often whilst serving with their Units in the town. Similarly, Fairfield Churchyard contains 15 such burials of men who died of wounds or illness, many, again, passing away in local Hospitals. 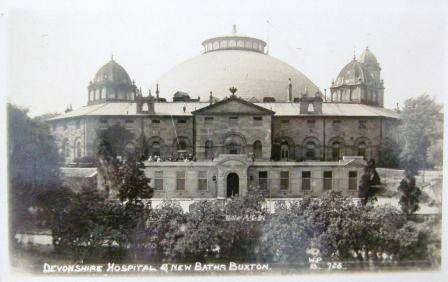 1: The Devonshire [Royal] Hospital: had been treating patients in the town since 1859, and continued using Buxton Thermal Water to treat soldiers for rheumatism and related disorders. 3: Buxton Red Cross Special Hospital: opened on the 1st February 1916 and remained in operation until the 26th March 1919. 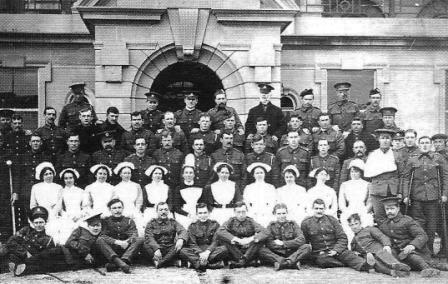 4: The Canadian Discharge Hospital/Depot [CDD]: with so many Canadian soldiers being treated in the town, it was decided to locate the CDD in Buxton, opening in December 1916. 5: The Granville Canadian Special Hospital: transferred from Ramsgate in October 1917 and re-opened in Buxton by the 8th November 1917. One of the earliest mentions of Buxton being used for wounded men was published in the "London Monitor and New Era", Saturday, 19th December 1914, which reported: "A wounded Belgian soldier at the Royal Exchange Hospital, Buxton, [who] had a welcome surprise on Thursday of last week. While having tea with a sympathising friend he received news that his wife had arrived. The poor woman, on hearing that her husband was in hospital in Buxton, had immediately set out from Brussels, and managed to reach England safely, but almost destitute." On the 30th January 1915 'The Buxton Advertiser' reported that 15, out of 49, Belgian soldiers, who had been treated at the same Hospital, had left on the 1.15 p.m. train on the previous Thursday, and: "… were extremely thankful for the kindness shown by Buxtonians.". Exchange is the large building in the centre-left. N.B. 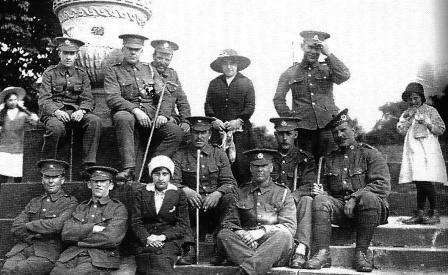 Vera Brittain (Author of 'Testament of Youth') lived in Buxton, at 'Melrose', Park Road, and after her admission to Somerville College, Oxford, in 1914 she became one of the first students to be granted leave to become a Voluntary Aid Detachment (VAD) nurse. It is quite possible, therefore, that she trained at this Hospital, before being posted. Vera's brother, Captain Edward Harold Brittain, and his close friend Lieutenant Jerry Knowles Garnett, are both commemorated on this site, their graves were visited by Vera when she served in Malta. N.B. In 1934 King George V gave his permission for the hospital to be known as the Devonshire Royal Hospital. In 1798 the Duke of Devonshire built a range of magnificent stables, in the form of an irregular octagon, with stalls for 110 horses and an inner circular exercising ground 50m. in diameter. Within this area is a circle of columns forming a colonnade 4m. wide around the inner space. By 1858 there had become a need for the shelter for those journeying to Buxton for Spa-water treatment. The Duke of Devonshire, therefore, allowed the building to be converted to a hospital and it opened for patients in 1859. The remaining buildings, the hot baths in George Street, together with the grounds were conveyed to the Hospital trustees by the Duke of Devonshire in 1878, and in 1881 the great dome was added to provide cover and to enclose the whole of the central area. This was made possible by a grant of £24,000 from the Cotton Famine Relief Fund in recognition of services rendered to distressed cotton operatives from northern mill towns during the American Civil War. The Dome has an internal diameter of 154 feet [47m.] and was the largest unsupported structure of its kind in the world until the construction of the Sportsdrome in Houston, Texas. In 1916 new baths were acquired within the hospital building, which consisted initially of immersion baths for a single patient. These can be seen on a 'YouTube' video showing soldiers being treated for rheumatism in the Devonshire Hospital. Such was the treatment offered in 'The Dome' that "T. Jones" was moved to send a poem from Bangor to 'The Buxton Advertiser' (published on the 1st September 1917) extolling its virtues - read: "The Dome's Blessings". Another 'YouTube' video shows the opening of Canadian Hospital at Buxton. General Sir Sam Hughes with the Duchess of Devonshire are seen entering the Devonshire Hospital, going up steps and shaking hands with line of nurses. The presence of the Duchess is significant as her husband, the Duke, was at that time serving as Governor General of Canada. 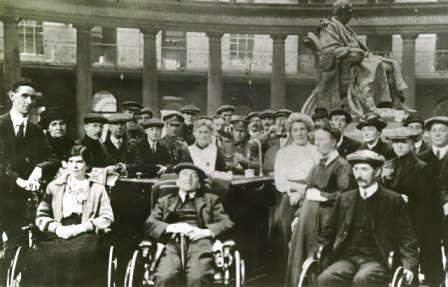 there were already 130 men at The Devonshire Hospital. he was soaked through for three days at Mons." As stated above the War Diaries for this Hospital show that it opened on the 1st February 1916 and remained in operation until the 26th March 1919. "The Canadian Great War Project" has records for 12 Doctors and Nurses of the Canadian Army Medical Corps [CAMC] who served at Buxton, and their records can be accessed by clicking the CGWP link. The first CO was Lt. Col. Henry D. Johnson. members of the Canadian Red Cross Society. 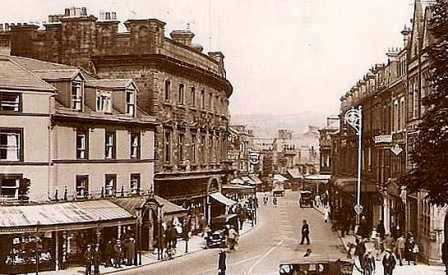 The very large Empire Hotel - see picture above right (now demolished) - was chosen for the Depot and was requisitioned for use. Officers of the Hospital as photographed above outside the Hotel. By December 1916 the hotel was ready for receiving its first patients. Whilst in operation the Depot could deal with up to 1,000 men at a time. The Canadian discharge depot at Buxton, Colonel Paul Hansen commanding, is for future to be used for sending home married men with dependents in England. This discharge depot will work in conjunction with the Canadian emigration offices in London which are now charged with the repatriation of soldiers’ dependents. The new arrangements are confidently expected to work efficiently, and to obviate the dissatisfaction which existed in the past, and which cannot be denied has often been legitimate." The Depot also had a Band which was often present to play at funerals of both Canadian and local men being buried in Buxton Cemetery. The Canadian Discharge Depot was reported to have one of the best bands in the Canadian Expeditionary Force. Under the "enthusiastic and energetic leadership of Bandmaster W. A. Leggett; W.O., ... its endeavours, backed by the support of the members of the band, have brought a measure of success of which he can be justly proud." The Band was composed of men from almost every Unit of the Canadian Expeditionary Force, the majority of whom had seen service in France. It was added to at times by bandsmen passing through the Depot on their way to Canada. "Entertainment of the transients is its primary object, providing music for route marches, parades, church services, and concerts. That the Band has no idle time is evidenced by the fact that it attends all church parades, gives concerts every night, not only at the Depot but at the various Canadian Hospitals in Buxton, and always marches the boys off to the station and plays them off as they entrain." 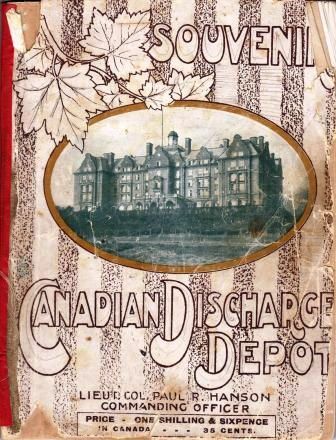 As a memento of their stay in Buxton a "Souvenir of the Canadian discharge depot. 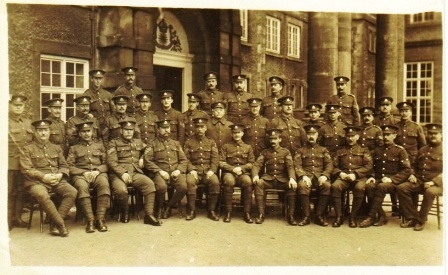 each of the soldiers who were posted to the Depot. The 'Wartime Canada' project has commented that "The staff of the Canadian Discharge Depot at Buxton made the 1918 Christmas festivities as pleasant as possible, in the full knowledge that the soldiers were desperately keen to get home." 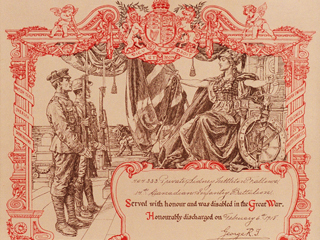 The site has also published images of the "Christmas Day, 1918" dinner menu and beer ticket. The War Diaries for the Granville Canadian Special Hospital show that it was originally located in Ramsgate, Kent. The Hospital was opened in Ramsgate for the reception of patients on the 20th November 1915, but was not officially opened until the 30th June 1916. However, owing to the air raids in the Ramsgate area the military authorities looked around for a more suitable location in which to replant the "Granville Special," and Buxton was finally decided upon. Whether or not this was influenced by the Duke of Devonshire, who was at that time serving as Governor General of Canada, is not known. The work of moving the Granville equipment from Ramsgate began in the third week in October 1917, and by the 8th November it was ready for the reception of patients at their new site, indeed it received the first convoy of 28 patients on that date. The hospital gradually filled up until there were about 1100 men undergoing the special treatment for which the Granville was so well adapted. 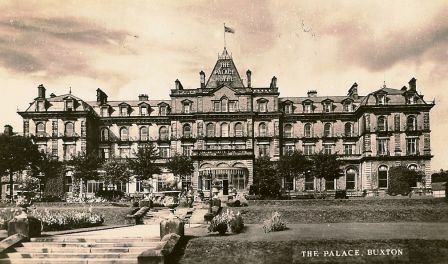 To achieve the transfer of the Hospital to Buxton the authorities took the two largest and most palatial hotels in the town, i.e. 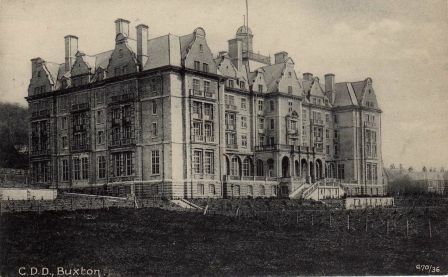 the Buxton Hydro Hotel, with bed capacity of 700, and which was said to "contain all of the most up-to-date surgical appliances yet invented, many of which are made in the machine shops of the Arts and Crafts Department of the hospital". 6. The Oddfellows' Hall, along with the Torr Street gymnasium, for the Gymnasium Department. Soldiers and Staff of the Granville Hospital, photographed on The Slopes, Buxton, near to where the War Memorial would be built. 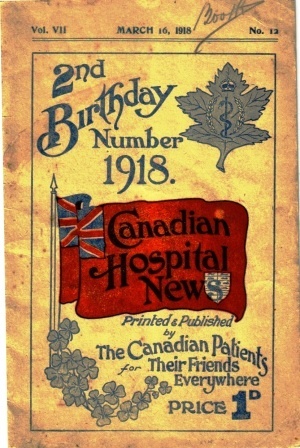 The Hospital even published a magazine, called "Canadian Hospital News"